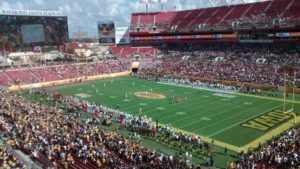 (Tampa, FL) The USF Bulls football team will return to the field on Tuesday, March 19 for the first of 15 spring practices to prepare for their third season under head coach Charlie Strong. Strong announced one of those spring practices will be held on location at Clearwater Central Catholic High School on Saturday, April 6 and will be open to the public. The open practice is scheduled from 10:45 a.m. to 12:45 p.m. The USF Spring Game presented by USF Federal Credit Union will once again return to Corbett Stadium on the USF campus on Saturday, April 13 with a 1 p.m. kickoff. The spring game, which has drawn capacity crowds the past four seasons to Corbett Stadium, is free to the public and will cap off a day of entertainment on campus that begins with a street festival starting at 11 a.m. outside the stadium. The 2019 Bulls return 16 starters (9 offense, 5 defense, 2 specialists) from a 2018 squad that reached the program’s fourth straight bowl game. USF will feature a new offensive coordinator in Kerwin Bell, who led Valdosta State to an NCAA Division II national championship with the nation’s top scoring offense (52.0 ppg) last year. Bell will take the reins of an offense that returns starting quarterback Blake Barnett (2,710 passing yards), first team all-conference tight end Mitchell Wilcox (540 receiving yards), tailbacks Jordan Cronkrite (1,121 rushing yards) and Johnny Ford (787 rushing yards), leading receiver Randall St. Felix (679 receiving yards) and all five starters along the offensive line from the Gasparilla Bowl. USF’s defensive returners are led by second-leading tackler Greg Reaves (89 tackles), who is expected to return to his defensive end position after starting the final seven games of 2018 at linebacker. Honorable mention all-conference cornerback Mike Hampton returns after posting the second-most pass defenses (18) in program history, as do safety Nick Roberts, who led the team with three interceptions and was fourth with 72 tackles, and defensive end Kirk Livingstone, who tied for the team lead with 10 tackles for loss and was fifth with 56 tackles. 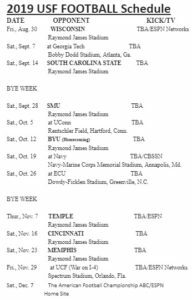 USF will play seven games in Raymond James Stadium during the 2019 season, highlighted by visits from preseason top 25-ranked Wisconsin to open the season (Aug. 30) and BYU (Oct. 12) in the non-conference slate and three straight November home games vs. conference contenders Temple (Nov. 7), Cincinnati (Nov. 16) and Memphis (Nov. 23). (Tampa, FL) The USF Bulls Spring Football Game will once again return to Corbett Stadium on the USF campus on Saturday, April 13 with a 1 p.m. kickoff. The spring game is free to the public and will cap off a day of entertainment on campus that begins with a street festival starting at 11AM outside the stadium. Normal pregame tailgating activities will be allowed in campus lots. Fans are also encouraged to bring blankets and utilize seating areas on the grass berms surrounding the playing surface as a large crowd is expected. Fans will get their first look at a 2019 Bulls team that returns 16 starters. USF’s third season under head coach Charlie Strong will feature a new offensive coordinator in Kerwin Bell, who led Valdosta State to an NCAA Division II national championship with the nation’s top scoring offense (52.0 ppg) last year. Bell will take the reins of an offense that returns starting quarterback Blake Barnett (2,710 passing yards), first team all-conference tight end Mitchell Wilcox (540 receiving yards), tailbacks Jordan Cronkrite (1,121 rushing yards) and Johnny Ford (787 rushing yards), leading receiver Randall St. Felix (679 receiving yards) and all five starters along the offensive line. The defensive returners are led by second-leading tackler Greg Reaves (89 tackles), who is expected to return to his defensive end position after starting the final seven games of 2018 at linebacker. Honorable mention all-conference cornerback Mike Hampton returns after posting the second-most pass defenses (18) in program history, as do safety Nick Roberts, who led the team with three interceptions and was fourth with 72 tackles, and defensive end Kirk Livingstone, who tied for the team lead with 10 tackles for loss and was fifth with 56 tackles. The Bulls will take the field for the first of 15 spring practices on March 19 and will practice for four weeks leading up to the spring game. (Tampa, FL) University of South Florida Head Football Coach Charlie Strong has completed the Bulls’ coaching staff, officially adding one offensive coach and three defensive coaches to the staff for his third season at the helm. On the offensive side of the ball, Strong announced the addition of Jeremy Darveau as offensive line coach. Darveau rejoins new Bulls offensive coordinator Kerwin Bell as the pair helped lead Valdosta State to an NCAA Division II national championship with the highest scoring offense (52.0 ppg) in the division last season. Also joining USF from the Valdosta staff are Kade Bell and Andrew Robustelli, who were both standouts playing under Bell at Jacksonville University and will serve as quality control analysts for the offense at USF. On the defensive side of the ball, Strong announced the promotion of Bryan Hill to safeties coach. Hill served the last two seasons on the USF staff in a quality control position for the defense. Strong also announced the addition of Steve Ellis as defensive backs coach and Paul Spicer as defensive line coach as well as a positional change for current assistant coach Sean Cronin, who will now coach outside linebackers. Ellis joins the USF program from Middle Tennessee State, where he served as cornerbacks coach/recruiting coordinator last season and previously served as co-defensive coordinator. Spicer joins USF from the Tampa Bay Buccaneers, where he served as assistant defensive line coach for the last four seasons. Strong also announced the promotion of Albert Boone to director of football operations, replacing Clifford Snow, who departed to pursue opportunities outside of football. Boone had previously served as director of on campus recruiting. 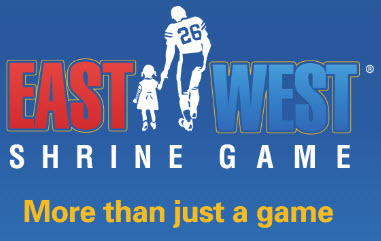 Doug Miles recaps the 2019 East West Shrine College Football All-Star game from Tropicana Field in St. Petersburg, FL. 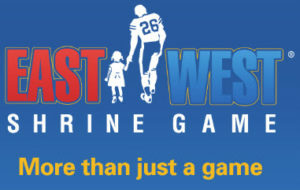 (St. Petersburg, FL) The East-West Shrine Game, the nation’s longest running college all-star football game, will air Saturday, January 19 on an international radio network including over one hundred fifty stations led by SB Nation Radio, on SiriusXM radios and the SiriusXM app (SiriusXM NFL Radio, channel 88) as well as online at shrinegame.com. The broadcast will be available on phones, tablets and other connected devices via the free Tunein internet radio app for mobile devices. WHBO 1040 will be the local Tampa Bay flagship station for the national broadcast. For the eighth year, Patrick Kinas will lead the live broadcast from Tropicana Field in St. Petersburg, Fla. Kinas is a veteran play-by-play broadcaster heard nationally on Westwood One’s college football and basketball coverage while also hosting the Opening and Closing Ceremonies of the 2018 Winter Olympics in PyeongChang, South Korea for Westwood One earlier this year. Patrick is also in his 7th year as voice of the Durham Bulls (Triple-A, Tampa Bay Rays) and made several substitute appearances on the Rays Radio Network in 2018 as well. Eight-year National Football League veteran (Falcons & Seahawks) Derek Rackley returns to the booth as analyst for the game broadcast. Since retiring from the League, Rackley has been active in booths for Big Ten and CBS Sports Networks and most recently broadcast NCAA and NFL games on Westwood One’s national radio network. Former NFL and MLB All Star Brian Jordan return for the 7th year to add his perspective to this iconic event and action on the field. Michigan broadcaster Rick Berkey will again patrol the sidelines, interviewing players, NFL coaches and all-star guests in attendance in support of the game’s beneficiary, Shriners Hospitals for Children®. The game radio broadcast airs at 2:15 p.m. EST with kickoff scheduled for 3:07 p.m. EST. The four and a half hour broadcast will be filled with exciting game action, interesting player stories, and interviews conducted live from the sidelines. The broadcast will highlight the important work of Shriners Hospitals for Children, featuring the 2019 patient ambassadors and their parents. 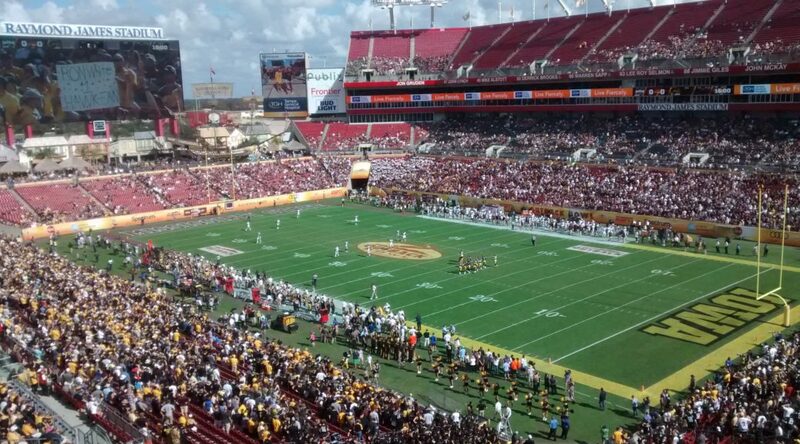 St. Petersburg based Play-by-Play Sports Properties LLC produces the broadcasts. Joe Bourdow serves as Executive Producer. Additional information about the radio network broadcast is available at shrinegame.com.